Hope you’ve all been enjoying this Bank Holiday weekend. It’s been a very chilled one for me, which I’m not mad at. It’s always good to have chilled days off. Today’s post is about this beautiful, visually attractive brush set from a new company called Indy Luxe. I must admit, these brushes were so easy to photograph because of how pretty they look. 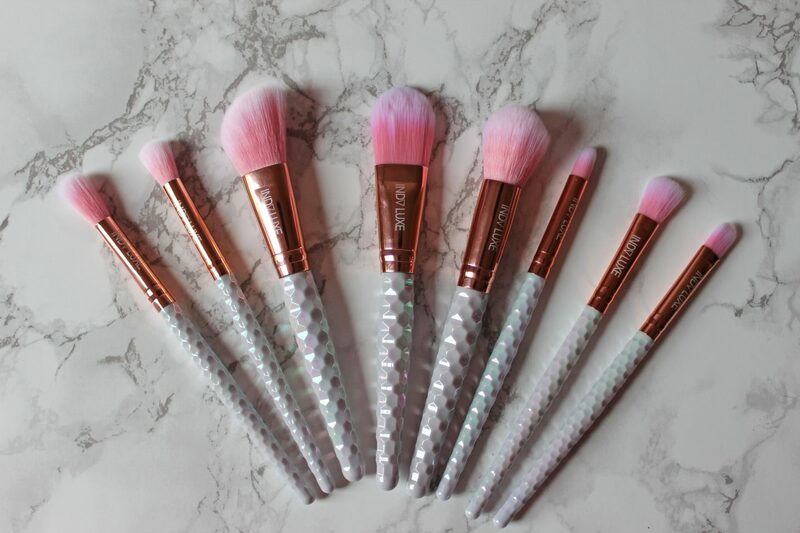 This set includes 8 brushes that are all beautifully made with hexagon shaped handles and rose gold detailing. The set includes 5 eye brushes and 3 face brushes. I really like how the brand name shines through so proudly on the rose gold detailing. Because the handles are shaped as a prism of hexagons, they also come off pearlescent as the style suggests, and it does stay true to its name indeed. From the pink and white ombre bristles to the white prismed handles, the unicorn vibes are shining through in full force. The brushes are of soft synthetic bristles and feel super soft! An extra bonus to know is that they are also cruelty free and vegan friendly. Another thing to make note of is that these brushes have shorter handles than my normal brushes. Just something to be aware of if you keep your brushes in a particular stand or holder. Although, they won’t be a problem at all to store. Upon first impressions, these brushes look and feel so lovely. 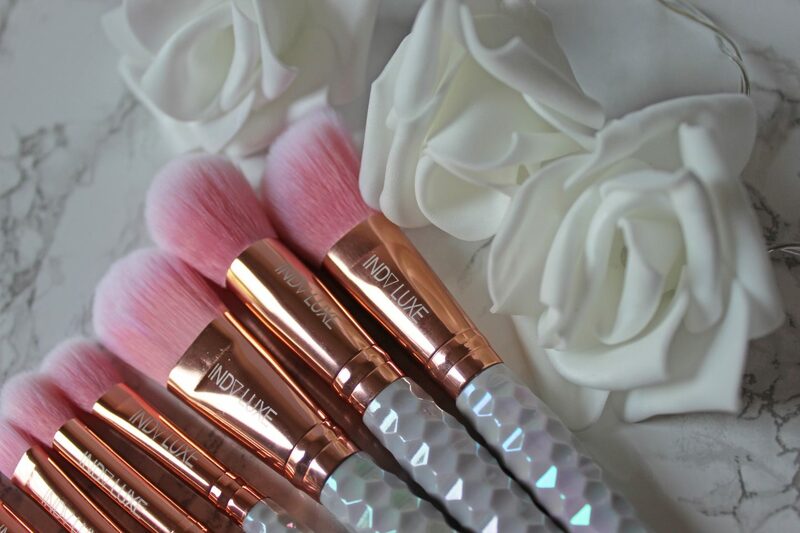 The colour combinations of white, rose gold and white/pink ombre bristles come together so nicely. This is a set of brushes that are unlike any other brushes that I own. Definitely a unique bunch in my collection now and for all the right reasons. 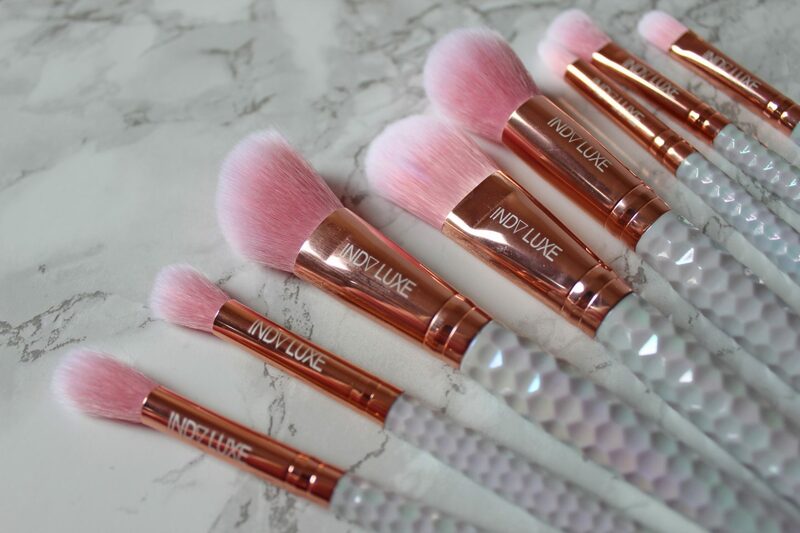 Well done to Indy Luxe for coming out with these brushes as well as their other Rose Gold Set. They’ve done a great job so far and I’m keen to see more from this brand. This post is not sponsored but I do however have a discount code that you can use to get 20% off your purchase on the Indy Luxe website. The code is ‘ LILY20 ‘ . The selling price for this set is £22. 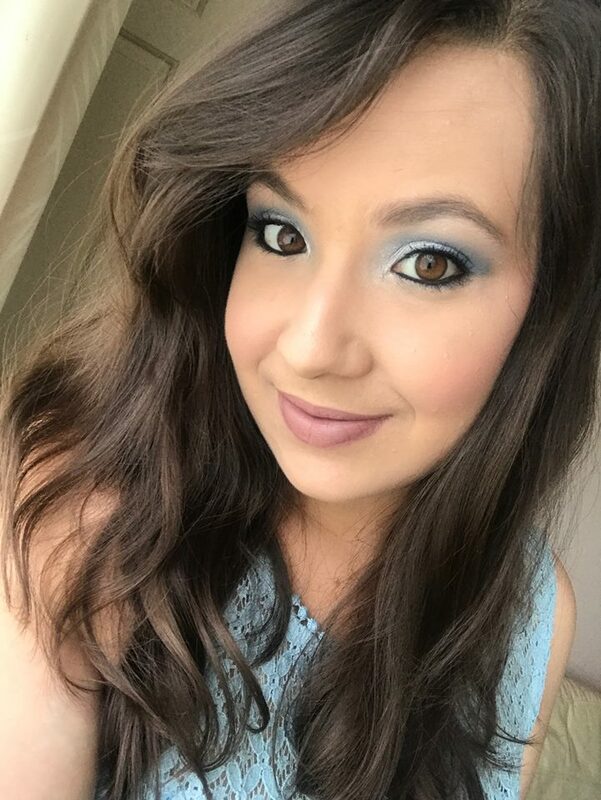 I’m an affiliate with Indy Luxe, so I do get a small commission from each order using this code. 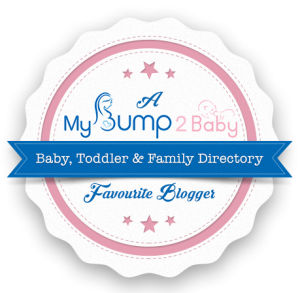 Hope you enjoyed this post and have a lovely week ahead!